Home » Blog » Secretly you’re thinking, make me a damn logo! Secretly you’re thinking, make me a damn logo! I can’t tell you how many times I am referred to in my early days when I started my business as a graphic designer. This was a common barrier I came across because as a brand strategist there is so much more than I do. Not to diminish any designers out there, because I still am part designer and my love for great design runs deep. But what I found was I was insanely good and passionate about helping business owners define their purpose, and declare what they want to be known for, and help their story come to life through brand building, not only through a logo but to build a strategic plan around how to live their brand from one touchpoint to the other and in their marketing . I help them infuse every piece of what they stand for into a secret sauce that brings them confidence, more customers and a brand they love. A brand strategy is where it all starts – a great brand, a successful business, and growing market share. It doesn’t start with a pretty logo. Your brand is the entire experience you provide for your customer – it gives the customer a sense of loyalty and emotional connection to what you’re all about as a business. Brand Strategy: Your positioning, your message and how you are setting yourself apart in the market. You cannot have effective branding without a clear and relevant brand strategy. It fuels everything you do in your business. See for my in-depth brand strategy model. It’s about uncovering your brand essence, brand belief, UVP, and brand personality. 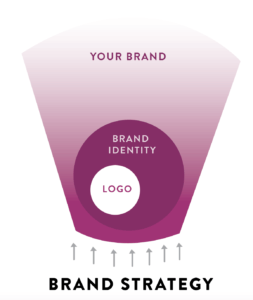 Brand Identity: this is who your brand comes across to your customer visually. Do you use the right colors, the right font pairings the right textures and photos? This is an extension of your brand strategy. Your identity is how your brand visually takes form. Using the brand strategy as a lens to create the visual identity. Logo: Visual representation of what your company stands for. It’s not about the color or fonts as much as it is about the concept of why your organization exists. Here from a past client and skeptic! NOW that I have gone through her process there is NO WAY we could have created the amazing presence that we now have without going through her process. The results and response we are getting from people are incredible and I know that is in a large part because of what Michelle created. Use your brand personality to define your colors, fonts, and logo. Use your brand essence to create a killer tagline that builds upon the core purpose of your organization. If you’re all about giving people choices to live life the way they choose – use the key phrases, Mychoice as the company name and life live the way you choose for the tagline. Use your brand belief as a bold, unique statement to grab the attention and emotionally connect with those on your marketing. For a full brand audit – please reach out!